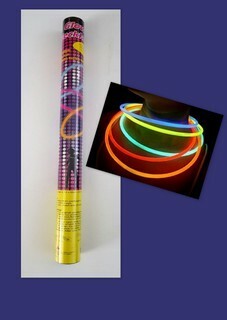 Each necklace is a single long 550mm glow stick (that's 22 inches and over half a meter long). There are 50 of these in each multi-color pack. Once a necklace is removed from the pack it should be used as the inner tube will break quite easily in some places after it has been removed. Bend it between your fingers along its entire length so that you hear the internal tube breaking all the way along as you go. Use a connector provided to join the two ends...............and don't forget to put it around your neck.